Do you offer static IP's?..and can the changes be made via TR69 feature?..assuming the Cellpipe supports it. 1 x Static IP is standard for all our connections. The changes would be in the router off the back of the cellpipe ,so for instance in the router config you would have had authenticate via PPPOE and popped your details in there. You would have to change to Static, or DHCP depending on how you wanted it set up. Well static IP's would go some way to resolving a RAS issue which has killed RipWiRE in the past. Is LittleBigOne offering static IP's as standard too? Ya know, I switched to using Google's public DNS so long ago I'd forgotten about the DNS issues. If PPPoE is possible to ditch, then that'd be the way for me and static IP's would be a blessing - I gave one up moving to Ripwire, it wasn't a major issue, but it did wrankle a bit. Changing the auth/connection method/settings wouldn't cause me any problem. 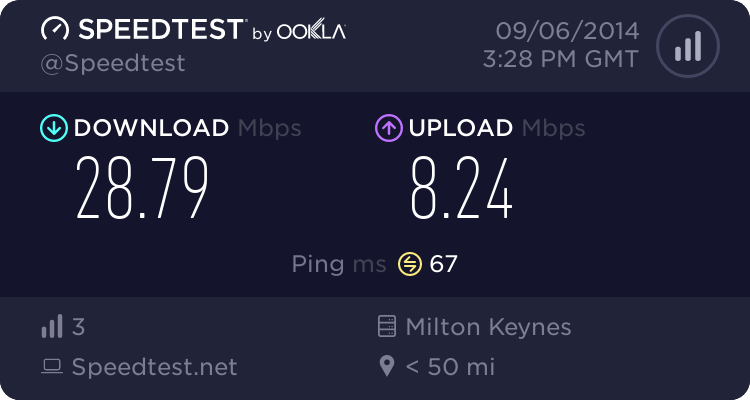 I'm putting two and two together that the drop off in download speed and Ripwire ceasing are linked, since they happened virtually simultaneously - interestingly, my upload rate has remained fairly static at around 8 meg. 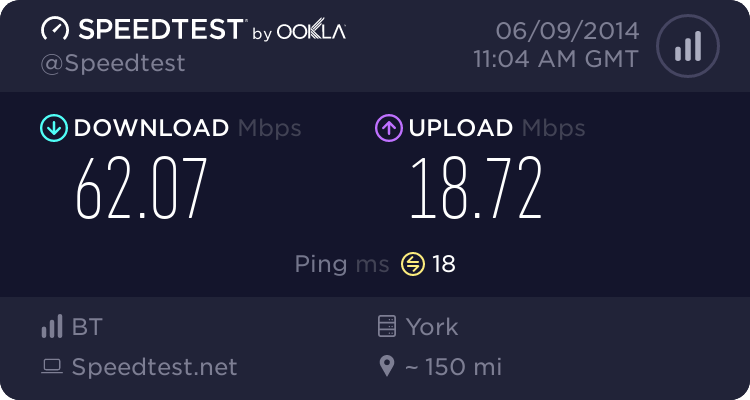 My Ripwire speeds have been pretty steady for a year, until this last week where I have noticed them fluctuating since last weekend. SpencerUK: I didn't have to pay any fees to move to Origin. I originally contacted them about moving in early January and was told £15 to cover admin. I was then told yesterday that I could move without this admin charge. @Smokinloads: I'm going to say that once you leave Ripwire your disconnections will more or less stop unless you have other issues. What you need to find out is if your VDSL has ever dropped when you get disconnected. Mine never did and Ripwire would not admit they had any problems, but since leaving them I've not had any of the disconnections I was experiencing with them every week (at one stage it was every other day or so). If we didn't have a powercut last Sunday my connection would have been active for 19 days and if I hadn't reconfigured the router it would have been active since install. I never went more than a week with Ripwire without being disconnected and that's with the same router. Also Ripwire did provide static ip's - as i asked for one due to the constant disconnections and ras issues where I couldn't re-obtain an address. If you were one of the early adopters (like me i was their first consumer customer from what they told me) they would have given you it for free. I was an early adpoter too - originally was set up with an IP from their test range, then had a static for a while - they bumped me across to the dynamic PPPoE stuff when they shifted and I guess I didn't kick up enough fuss about the disconnects. yeh, that's how i found i was having problems due to online gaming constantly disconnecting - it cost me nearly £300 in proving to them it was not my line or equipment - they were just grasping at straws as didn't want to acknowledge it was them with the problems and made the customer out to be that they didn't know what they were talking about. That's what made it worse for them to accept it as nobody would kick up a fuss about, except for me - from what they told me over 33% of tickets they handled were mine because of the issues i had experienced. I even gave them evidence from multiple parties but that never worked either. Overall it is sad to see a company fail, but I don't think they helped themselves and I don't think they will be missed.